Here you see both crosses from last week's entry and with a lots more context. We're looking southwest from Taos Pueblo and you can see how large La Morada really is. Usually these lay chapels are quite tiny which may reflect the size of the Penitente community and its limited resources in 1830 or so but the Morada of Our Lady of Guadalupe is a substantial edifice..
We do know that this morada is the largest and least altered one in New Mexico. 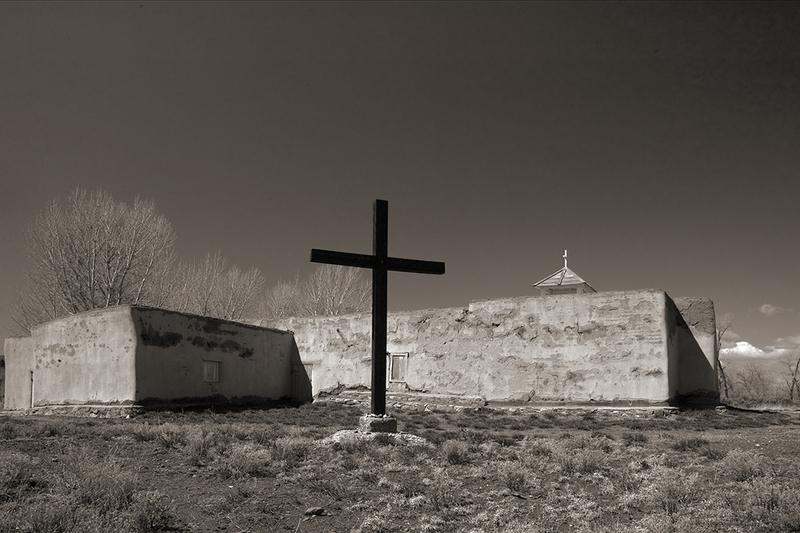 It may also have been the first and most important of all the moradas in northern New Mexico and southern Colorado. These lay chapels were built in response to the secularization of the Catholic church by the Franciscan Brotherhood which left "genizaros", those of mixed Spanish and Indian blood, on the outside looking in. The genizaros were usually former slaves who, even after becoming free, were not accorded the rights of truly free men.